So I took a week off from blogging for a couple of reasons. First, I didn’t have much to say, and the Valentine’s Day post seemed to get a lot of attention (though I may be misreading my spam folder). The other is because I’ve been horribly busy (and in this business, when in time of feast you feast to prepare for possible famine). Anyway, I bring this topic up because I even found myself saying “sorry” to my wife for things I did (no, not for having a lousy Valentine’s Day…that was actually really cool), and I found a very peculiar thing. 4. I said it, knowing that she trusts me, and I had no intention of changing, despite what I said. I knew she would accept it at face value and let it go if I said I was sorry. From where I sit, “I’m sorry” doesn’t mean much in American culture anymore. If you really think about how many times we say it, and how many situations we’ve used it in, is there truly a moment when we use I’m sorry to ask for forgiveness with the purpose of actually doing our best to ensure that it doesn’t happen again? 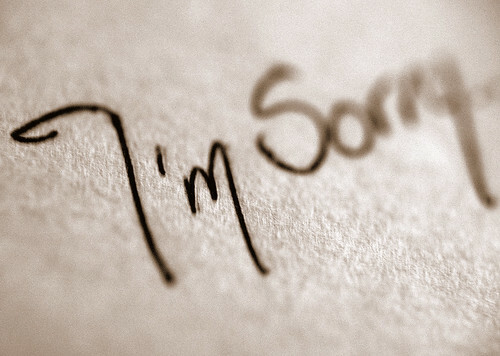 Accroding to a research study done at Cornell University, when it comes to insincere and sincere apologies, “targets of such apologies are not likely to respond differently.” Since people don’t respond differently to apologies, whether we mean them or not, it would make sense as to why we continue to use insincere apologies. In fact, they assert that the reasoning behind using insincere apologies are to feel good about oneself and to be seen positively by others. Both of these reasons have nothing to do with what you’ve done to the other person. 5. And in a good faith effort, endeavor to rebuild your trust by never doing what I did to hurt you again. That’s a lot, but we’ve condensed it down because its easier to say I’m sorry than it is to actually apologize. What do you think? How do you apologize? Are your apologies sincere or insincere? Let me know what you think.